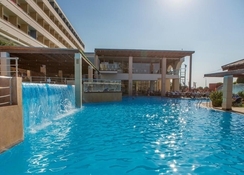 The Oceanis Hotel Rhodes is located on the lovely beach of Ixia between Rhodes Town and Diagoras Airport. The Rhodes airport is just 10km from the hotel. Offering unobstructed views of the blue Aegean Sea and in an enviable location in close proximity of shops, taverns and entertainment clubs the hotel promises a comfortable stay with optimum rest and relaxation to guests. Lovely pools, a fine restaurant and a pool bar and modern amenities await guests at the Oceanis. Immaculate, well-furnished rooms with beautiful views of the scenic surroundings come with air- conditioning, satellite TV and en-suite bathroom with a bath, hairdryer and free toiletries. 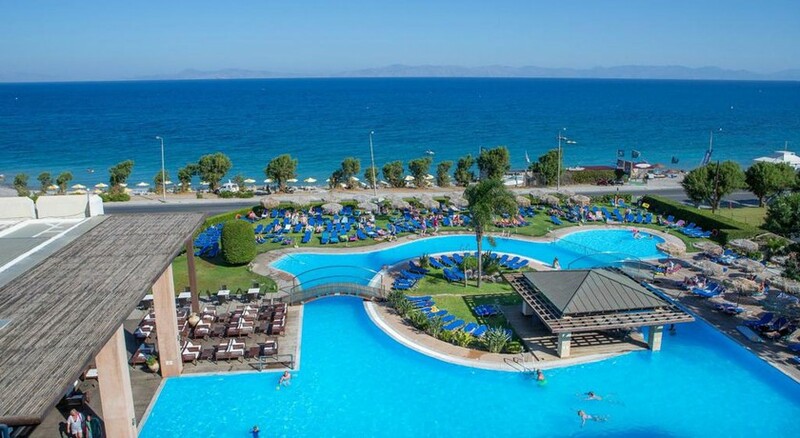 Oceanis Hotel Rhodes is located on the lovely beach of Ixia between Rhodes Town and Diagoras Airport. The airport is at a distance of 10km. Many bars, cafés and grocery stores are located 500m from the hotel. Free private parking is available on the site. 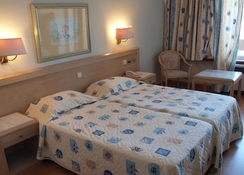 Oceanis Hotel Rhodes offers 242 spacious rooms for its guests. Immaculate, well-furnished rooms with beautiful views of the scenic surroundings come with air- conditioning, satellite TV and en-suite bathroom with a bath, hairdryer and free toiletries. These have balconies providing excellent Aegean Sea or garden views. The classy air-conditioned main restaurant at The Oceanis Hotel offers a sumptuous American buffet breakfast; there is also a wide array of Greek & international delicacies served with friendly service an amazing ambience. Guests can enjoy panoramic view of the blue Aegean while dining. The snack bar by the pool serves snacks and beverages during daytime. In the evening, guests can relax at the main bar with a relaxing cocktail. The Oceanis Hotel has two swimming pools and kids’ pool and terrace besides easy access to the beach. There is a lovely spa with steam room offering massages and therapies and beauty services are available. Tiny tots can have fun at Kid’s Club or Playground. The hotel has facilities for Bicycle Rentals, Table tennis, Tennis and Billiards. The hotel’s on-site Water Sports Centre offers diving, windsurfing and sailing. Guests can also shop at the shops on-site. There is lively evening entertainment and a nightclub too. 24-hour front desk Outdoors Outdoor furniture Beach Front Sun terrace Garden Swimming pool Kids Pool Massage chair Body treatments Pedicure Manicure Hair treatments Facial treatments Beauty Services Sun umbrellas Sun loungers or beach chairs pool bar Outdoor pool Outdoor pool (seasonal) Massage (Additional charge) Spa and wellness centre Sauna Beach Tennis equipment Evening entertainment Kids club Entertainment staff Bicycle rental (additional charge) Table tennis Billiards (Additional charge) Tennis court Kid meals Special diet menus (on request) Snack bar Bar Restaurant Non Smoking Rooms Family rooms Lift heating Non-smoking throughout Air conditioning Mini market on site Paid Wi-Fi laundry (additional charge ) Currency exchange Gift shop car hire Fax/photocopying Luggage storage Shared Lounge/TV Area Daily maid service WiFi is available in all areas and costs EUR 1 per 30 minutes. Free! Free private parking is possible at a location nearby (reservation is not needed). WiFi is available in all areas and costs EUR 1 per 30 minutes.